On September 14, 1814, U.S. soldiers at Baltimore’s Fort McHenry raised a huge American flag to celebrate a crucial victory over British forces during the War of 1812. The sight of those “broad stripes and bright stars” inspired Francis Scott Key to write a song to the tune of “To Anacreon in Heaven,” a popular English song, that eventually became the United States national anthem. On Mach 3rd, 1931, President Herbert Hoover signs a congressional act making “The Star-Spangled Banner” the official national anthem of the United States. Key’s words gave new significance to a national symbol and started a tradition through which generations of Americans have invested the flag with their own meanings and memories. 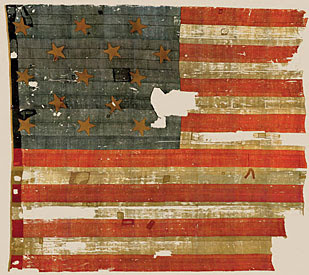 Explore the flag that inspired the National Anthem to discover stories about its creation, history, and preservation HERE ! Thank you for the awesome feed back!!!!! Call up your favorite FINS location to collect!!!! Get a FREE Fountain Beverage with any purchase! Spread the WORD, and share the love. After all, isn’t that what it’s all about?! John Adams believed that July 2nd was the correct date on which to celebrate the birth of American independence, and would reportedly turn down invitations to appear at July 4th events in protest. Adams and Thomas Jefferson both died on July 4, 1826–the 50th anniversary of the adoption of the Declaration of Independence. Sit Back – Relax – UnWind – Enjoy! Relax ~ UnWind ~ Enjoy! !